Our cloud native platform drives efficiencies and creates superior customer experiences. The result is better customer engagement at lower cost. Our platform's modular architecture and configurable components allow us to support a wide variety of clean energy products and services. Our component architecture enables highly customizable solutions. Elastic capabilities to scale as your portfolio scales. Compliant and secure infrastructure, data and processes. Our a-la-carte components, robust API layer and middleware architecture allows clients to leverage their existing systems rather than duplicating data and processes. Program design is variable. Proper use of software patterns and well defined object boundaries allows our software to support a wide variety of product models. 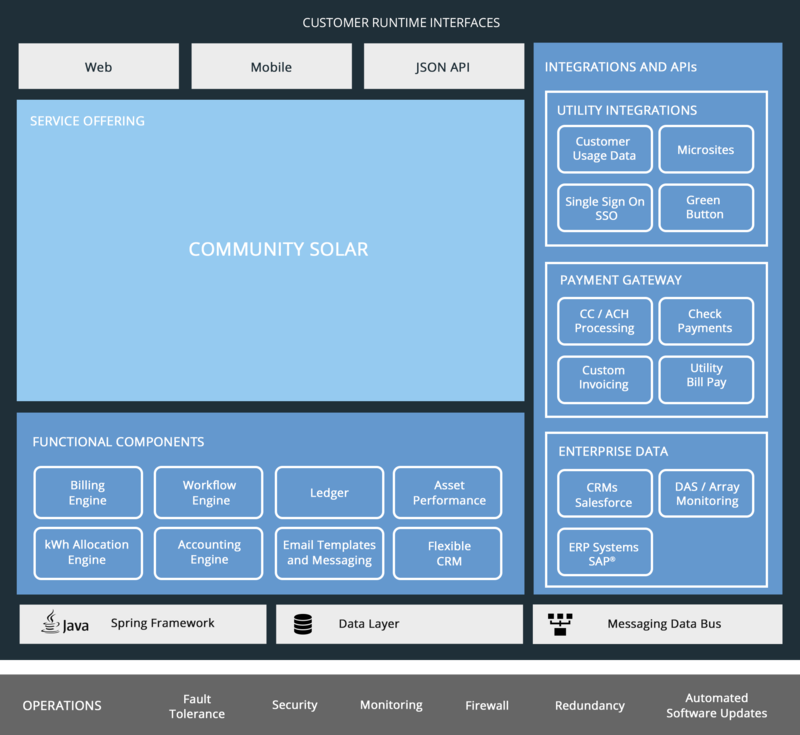 The functionality needed to support enterprise quality next generation clean energy programs. Our object hierarchy or data model mimics that of the utility. Customers have multiple accounts (meters) that can have different clean energy projects and services attached to them. Our platform supports a robust API layer consisting or API endpoints and services that can connect to network enabled enterprise ERP and CRM systems. Our platform supports a variety of role authorizations to allow different users to have different access (customers, field agent, backoffice, program admin, etc). We are always happy to discuss our technolgy or the industry more broadly. Give us a call today. See our platform in action and learn how our technology can work for you. Schedule a demo today. Are you looking for our marketplace?